clean out, reorganize and refreshing my Texas cottage. January has brought about change. now this is the rest of that story. It all started with the moving of two chairs. to a guest room and so forth. The pictures will share the new look. gave me the opportunity to add red. when we lived in Ohio over 20 years ago. It's a sturdy well built very comfortable chair. It's been in my red guestroom which has now changed too. All about that another day. the winter freshen up begins with my winter banner. I simply turned around the Gather banner and stenciled the new letters. It brings in the color. Birds and their house, perching here for the season. Vintage books from the 20's help to bring in a bit of red. Old architectural elements fill a metal basket on the hearth. The old ceiling tin has a little saying my grandmother used to sing to me. and a hug around the neck"
Tall Lavender fills a basket and brings in a touch of nature. It's working with red and I am loving it once again in our living space. Burlap with red roses says winter with the hope of springtime to follow. High on a old pillar is another sweet bird. This water fountain urn was made by my mother many years ago. I love to change this out with the season. Another bird takes his home behind the glass in this frame. A painting I did in a study last year. Winter whites soften the new look. This dear garden girl watches and waits for spring. Yes, the red plaid chair is working. is a small square of dark aqua. Could that be more perfect for when I add a touch of aqua this summer? I ask you, why didn't I bring this chair here before? Well, it's here now and enjoy it I will. Have you been making changes this season? The Silo's at Fixer Upper on HGTV. Happy Birthday to my Best Guy!! You have decorated the room so pretty and I love that chair and the fabric. I love your touches of red throughout. I hope you have a lovely week. I love seeing what new arrangements and vignettes you come up with. They're always lovely and so comfortable looking. Have a blessed week, my friend. That chair is fabulous! And I love all your wee birds. Happy Monday to you! Good Morning Dear Texas Friend! Beautiful Winter touches in your home. I too have a little red here and there-some sweet birds too and rosy red tulips! I agree with you so much about craving change. The beginning of the year is usually when I get the urge to paint a room. You made beautiful changes to your home just my adding in more color and a furniture swap. I love the new look!! I love all your touches of red around the room, Celeste, as it's my favorite color. I'm happy that your 20 year old chair found a home downstairs and was your inspiration for your changes. Your pretty birdie painting is wonderful, and I love the one above your mantle, too. I look forward to your review of the silos in Waco. Happy Birthday to your sweetheart!! Hugs and blessings are sent to you both! 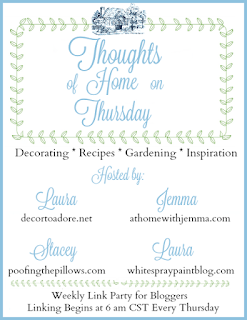 What a lovely inspiration this post is, for me to keep on working in my little cottage. Changes are happening, and hopefully major ones will be done before it gets hot and humid again. I love that crusty old blue and white vase that you have next to your sweet little bird painting. Very cheery and the red just pops and you have given us some inspiration to move a few things around in each of our own homes! I love how your photos have a dreamy quality about them! Have a great week and thanks for the peek into the new look for the season! Oh so pretty---your touch is always so elegant and fresh. I'm so sad I have lost my faded edge options for my pics---it's just so dreamy. When my comp upgraded, my pics down graded, and I'm lucky I can straighten and bring the light up I guess, but all the cool options are gone. Beautiful pictures, I have done nothing in the house except purge and post for the shop---will have to get going on SOMETHING creative, soon. Hi Celestina, your custom made chair looks so pretty and comfortable. I would love to rest on it. I love the way you change and brighten up your rooms. Celestina Marie, Another Great Monday designer post. Happy "B" day to you sweetheart too! Looks terrific! Beautiful decor! Like the chair! I just love your touches of the red and black with your white, so lovely!! Great style in that chair, it is good you waited this long to change things around, it probably came at just the right time. So neat you found a ceiling tile that reminded you of your grandmother, and how you have used things from your family to decorate with!! That bird in the nest is so sweet too. Your bird painting is amazing too! Can't wait to hear about your trip! Lovely and warm and inviting. That chair in first photo looks so comfy! I have been making subtle changes only : ) But even just re-arranging (what you already have) as you did can make nice difference. Hi Celestina! Your living room looks so cozy and inviting! So pretty! Little changes in a room can really refresh, love all your red touches and of course the perfect Winter Whites added in. You have a knack for creating warm and welcoming rooms and I always enjoy your reveals. Looking forward to the Silo's post. Hope you had a blast in Waco. Moving furniture around and doing little tweaks really gives you a new look. I love the bits of red that you added. The bluebird painting is so pretty. You are one creative girl, Celeste. Red - love it. It adds such vitality and warmth, perfect for this time of year. The red touches you've added here are all delightful, but I do love the little red bird best - it's adorable! You have a wonderful talent for changing things around, Celeste, I love this! So many little and big changes. I thing the red with black accents is just perfect and all of your smaller crafts and finds are so pretty. Please come here, I need your help!! Wishing you a wonderful new week, filled with joy, Love and blessings! Love your changes!! We heard that JoAnna and Chip are going to be at The Home Show in Cleveland, Ohio. My daughter and son-in-law are thinking about going. Can't wait to hear about your trip to the Silos. you have a warm, cozy and very beautiful home!! the pops of red seem to be a welcome addition!!! So many lovely things.....birds, vintage books, lavender, music, and pillows! Love how you re-used the gather banner -- what a smart idea! Visiting from Roses of Inspiration. Hi my sweetness! Oh, I adore that chair. I would love to have one just like it and it looks so pretty! All of your vignettes are so beautiful! Is that a piano beside your chair? If it is, wouldn't it look pretty to cover the back with some fabric? I'm not being bossy, just knowing you and your talent I think it would look beautiful! Thank you so much for your visit and your kind words and especially your prayers. How I appreciate them and you! Your room looks so lovely and so many sweet touches. I love Fixer Upper! How cool you get to visit the silos, hope you will post some pictures ;-) Have a wonderful day! 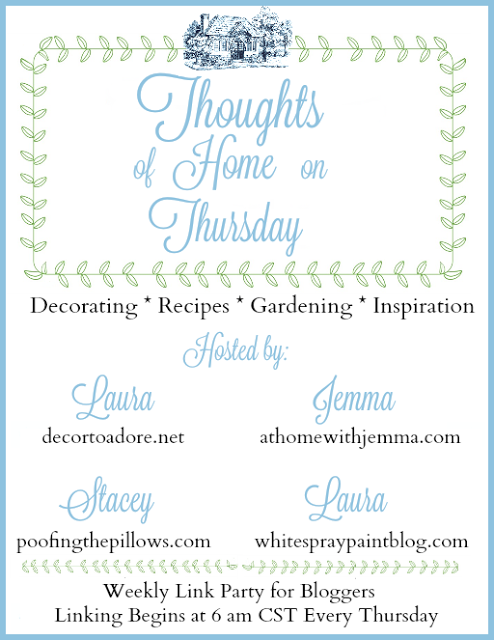 Thank you so much for sharing your beautiful home and showing off your pretty things! You've definitely got a knack for putting things together in an attractive way. That chair is gorgeous~! Have a lovely week! Love the red. You have such wonderful style my friend!! And a very Happy Birthday to your hubby. Your chair is so pretty and tucks just perfectly in the space. I love pops of red in interior spaces. It's so warm and festive! Your living room looks so inviting...just wonderful! I love your changes. I especially like your pillows! I so enjoy "walking" through your beautiful home, sweet Celeste. You know how to make one feel welcomed and you know how to make all things lovely :) You are truly an inspiration to many. The changes you have made in your rooms, made them even much more comfortable and cozier, so beautiful and filled with charm, you've such a lot of good tast, my darling Celestina ! Hi Celestina! Such beautiful and inspiring ideas! All details are gorgeous! Thanks for sharing. Celestine, your home is just filled with so many lovely things...I don't where I'd begin...but I noticed that pot with lavender. Last summer a neighbor gave me bunch and it currently growing outside in planter boxes, not blooming any more, of course. Any tips for bringing some inside and getting it bloom so pretty like yours is doing? I have had no experience with it until I received this. Thanks for any advice you can give! Happy Wednesday! Love the pillow on your chair. Sure are some cheery changes! Seriously you have hydrangeas? Nice! Celestina, your living room is so charming. I love the splashes of red that you have, and especially that little blue section. The garden girl is darling too, love her. Everything looks so warm and inviting. And your HOME pillow is a lovely accent to your couch. Happy Thoughts of Home on Thursday.